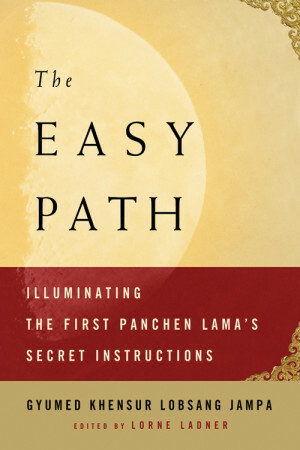 Wisdom Publications’ recently released book The Easy Path: Illuminating the First Panchen Lama’s Secret Instructions makes available for the first time in English the First Panchen Lama Losang Chokyi Gyaltsen’s Easy Path (Delam), a text nearly 400 years old, considered one of the eight great lam-rim texts, and part of a lineage that comes from Lama Tsongkhapa’s (1357-1419 CE) down through Gyalwa Ensapa (1505-1566) to the First Panchen Lama (1570-1662) and eventually to our modern day through Gyumed Khensur Rinpoche Lobsang Jampa. The Easy Path is Rinpoche’s insightful commentary, edited by student Lorne Ladner, and makes use of Joshua Cutler’s translation of the root text. Here, both the First Panchen Lama (in bold) and Rinpoche discuss the “object of negation,” the fundamental misunderstanding about self-identity that serves as the principal target for future meditations on emptiness. All the time, even in deep sleep, the mind clings tightly in the center of the heart the thought “I, I.” This is the innate misconception of a self. For instance, say that having done nothing wrong, you are accused falsely by someone, “You did such and such bad deed.” There then arises tightly in the center of your heart the thought “I, I”: “I did no such a wrong thing, yet I am being accused falsely.” At that time the way that the “I” is conceived by the innate misconception of a self is clear. Correctly, precisely identifying the object of negation is extremely important for meditation on selflessness. The Panchen Lama describes how you hold the thought “I, I” in the center of your chest, giving the example of how that feeling of “I” is intensified in your heart when you are falsely accused. This innate self-grasping is always there but appears more strongly and clearly when you are falsely accused. “Object of negation” refers to the way you experience the self: as though it exists from its own side, without depending on the mind and body, the five psychophyscial aggregates. It is, in other words, an instinctive sense that the self exists from its own side. Such a self does not exist at all. Lama Tsongkhapa explains in his Concise Instructions how this “self” that is the object of negation arises and appears experientially. It is not something that arises due to analysis. It spontaneously appears as though it exists from its own side, without having to depend on its basis of imputation – the five aggregates. Lama Tsongkhapa says that experientially, this self appears solidly. He uses the analogy of walking in pitch darkness, reaching out your hand, and suddenly touching a pillar. At such a moment, the pillar appears very solid to you. The pillar doesn’t seem at all to depend on anything – on having been constructed, on its parts, or on the label “pillar.” The experience of the self that is the object of negation is similar. Lama Tsongkhapa also says that that self appears like a lingering thought, always there in the back of your mind. This is likened to how when you touch a pillar in the dark, the pillar seems to you to have always been in that spot, primordially present. And, he says that that self also appears vividly to you. Again this can be likened to the experience of suddenly coming upon a pillar in the dark and how that pillar appears to your mind. This analogy and these adjectives are intended to help you identify the object of negation in your own experience. Shar Kalden Gyatso, a mahasiddha of the Gelug tradition sometimes called “a second Milarepa” due to his accomplishment of siddhis, describes in detail how the object of negation appears. He begins with an analogy, like Lama Tsongkhapa’s, of reaching out in the pitch darkness and touching a table. When you lay your hand on the table, you instinctually think and feel that the table exists from its own side and always has. It seems like you’re touching something that’s always been there, primordially. Although the existence of the table depends on many factors such as its component parts and your own imputation of “table” once you laid your hand on it, it ordinarily would never occur to you when you touch a table in the dark that it doesn’t exist from its own side. You never think at such a moment that it only arises in dependence on many factors including its component parts and your own labeling! You instinctively think that it existed prior to your touching it, that it exists from its own side, and that it doesn’t depend on its parts or your labeling. This is how you experience the object of negation. You instinctively think that the self existed in your mental and physical aggregates prior to your labeling it. You think it exists from its own side, and it doesn’t occur to you that it’s merely labeled by yourself. Your thought that a self exists from the side of the aggregates – that it exists there independently of your imputation – is the object that must be refuted. Kalden Gyatso continues by explaining that there are actually two objects that must be refuted or destroyed. One is that object just described – the independently existent “I” on the aggregates – which is actually a totally nonexistent entity. That is like a hallucination – something that appears to you but has never existed at all. The other is the subjective self – the mind that clings and grasps at that hallucination as though it did exist. It’s like a person with jaundice perceiving a Himalayan mountain as yellow. The yellow mountain doesn’t exist, but the person with jaundice does exist. Just so, while the object of negation – the truly existent self – doesn’t exist, the mind grasping at that false “I” does exist. This is important for your practice of meditation on emptiness. As you meditate on emptiness, you must come to see that the objective self doesn’t exist. But the subjective mind grasping at that object is not capable of such insight or analysis. That mind of ignorance cannot become wisdom; when emptiness is recognized, that subjective mind grasping at true existence has its continuum severed. So you must employ another part of your mind to analyze whether the truly existent self exists. One part of your mind experiences grasping at the truly existent self while another part of your mind analyzes that self, looking at all the logical contradictions. This second part of your mind eventually refutes the existence of the objective self. This is what destroys the continuum of the subjective mind grasping it. What continues is a wisdom mind. Kalden Gyatso concludes his discussion of the object of negation by offering to reveal the object of negation nakedly, just as it is. He then says that everything that appears to you is the object of negation! Your own body and mind as well as all external things appear to you as truly, inherently existent, and you then grasp and cling to that false mode of appearance. Although things do exist conventionally in mere name, ordinary beings have not yet realized emptiness and so cannot differentiate experientially between what’s conventionally existent and what’s the object of negation. Ordinary beings are always mistaken in actually believing in the false appearance of things existing from their own side. When you negate this false appearance, that simple negation induces the experience of emptiness. Gyumed Khensur Rinpoche Lobsang Jampa, Connecticut, US, 2009. Photo courtesy of Lorne Ladner. A student of the Dalai Lama, Gyumed Khensur Rinpoche Lobsang Jampa was born in Tibet in 1939. He is a top-ranking graduate from Sera Monastic University and a former abbot of Gyumed Tantric College. Khensur Rinpoche is the resident geshe at Guhyasamaja Center, the Washington, D.C.-area FPMT center, and spiritual director of Do Ngak Kunphen Ling Tibetan Buddhist Center for Universal Peace in Danbury, Connecticut. Lorne Ladner, Ph.D, is a clinical psychologist in private practice in the suburbs of Washington, D.C., where he also directs and teaches at the Guhyasamaja Center. He is the author of The Lost Art of Compassion and editor of The Wheel of Great Compassion. The Easy Path is available through Wisdom Publications, an FPMT-affiliated non-profit publishing house based in Boston, US.